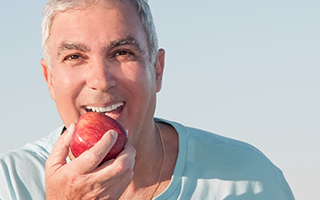 Many patients report they find it much easier to speak and eat properly after getting dental implants. 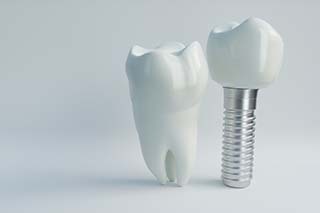 Implants are replacement tooth roots that fuse to the jawbone permanently, so there is no risk of slipping and discomfort once the treatment is complete. The implant supported replacement tooth or teeth are designed to look and function just like your real teeth. If you’re currently dealing with missing teeth, as in hiding your smile and adjusting your food choices, dental implants are simply the best way to rebuild your smile. They’ll look great, last a lifetime, and give you decades of daily benefits. To learn more and start getting your smile back today, please contact us for a consultation. 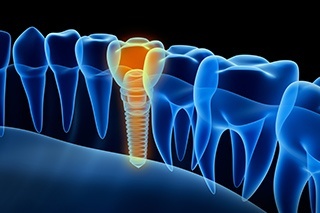 Dental implants are small posts that resemble screws. Once in place, dental implants mimic the lost root structures of missing teeth. Crafted from high quality, biocompatible materials, dental implant posts fuse with the supportive bone and gum tissue to anchor a replacement tooth or teeth and provide necessary stimulation to maintain natural jawbone density, gum tissue volume, and facial shape. We typically provide titanium implant posts as these are the most time tested materials, but there are also a variety of other metals used for implant posts. We can also provide metal-free zirconia implants for those patients who have allergies or sensitivities to metal. We perform dental implant surgery in the office and use digital technology to ensure proper dental implant placement. The procedure may sound intimidating, but it is actually very straightforward. We start by numbing the area around the lost tooth or teeth. Then, we make an incision in the gum tissue. The implant post is precisely positioned according to our placement plan. We also attach a protective cap that allows the implant site to heal and maintains the necessary gum tissue shape to accommodate the tooth replacement prosthetic. Once the implant is placed, it fuses to the jawbone and gum tissue. This process can take three to six months. When the fusion process is complete, patients return to our office, so we can attach an abutment. Once your abutment is in place, we capture the necessary images and impressions to design your custom dental crown, fixed bridge, partial, or full denture. Crowns and bridges are fantastic restorations on their own – but with dental implants, they are even better. If we’re replacing a single tooth with a dental implant, we’ll use something called an implant-retained crown. The crown will be made entirely of porcelain and be attached directly to the implant post. This will give you the best of everything, as the crown will look completely natural and be extremely stable thanks to the implant. We can even use implant-retained crowns to form a fixed bridge to replace multiple missing teeth. In the end, they simply are two of the best ways to close the gaps in your smile. Some denture wearers make the switch to an implant-retained denture to enjoy the benefit of more stability and a better fit. 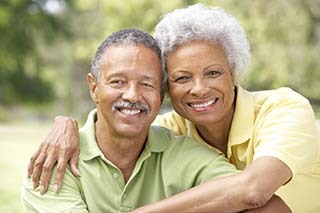 Dentures are secured in place with a set of dental implants so there is no need to use adhesives of any kind. Dental implants also help support the underlying bone, preventing resorption of the bone, which happens with dentures alone. Bar-Retained Dentures: Metal bars run along the gum line to create a foundation for the base of the dentures. The bars are attached to the top of the dental implant so the dentures rest firmly and securely on top. 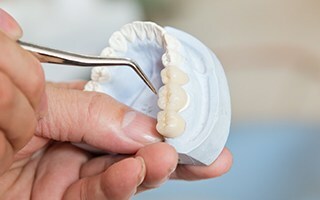 Ball-Retained Dentures: A ball-and-socket mechanism connects the base of the denture to the top of the implant and provides a very secure fit. This ensures the dentures do not shift, slip, or move in any way. Tooth replacement using dental implants is a complex restoration process, and we utilize a variety of state-of-the-art dental technologies to make the treatment process as streamlined and precise as possible. During the planning process, we utilize state-of-the-art 3D CT scans to ensure we have a complete picture of how your teeth work together within the bite. Then, we create surgical guides that ensure your dental implant is precisely placed for optimal chances of success. Throughout dental implant planning, placement, and restoration, we create a seamless process by using digital dentistry tools. The cost of your dental implant supported tooth replacement plan will vary dramatically based on your unique needs. However, the initial financial investment necessary for dental implants can be overwhelming to patients. It’s important to understand that these restorations can last a lifetime, so you’re not investing in a restoration that will need to be repaired or replaced in five or even ten years. You’re taking a little extra time and spending a little extra money up front for a natural looking, feeling, and functioning smile that can last decades. Before we begin these advanced treatment plans, we will walk you through the costs associated with every step of the process. 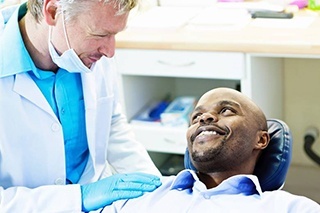 While dental insurance doesn’t usually offer coverage for the implant posts or their placement, you will likely receive some coverage for other parts of the process, including your replacement tooth or teeth and preparatory treatments like tooth extraction. Our team will take the time to maximize these benefits. We are also happy to work with patients to receive low and no interest financing plans. If you’re considering dental implants as one of the solutions to replace your teeth, they have a set of unique benefits that you simply can’t get anywhere else. Now that you know more about how they work and their process, you should know about what makes them worth the investment. Their comfort, function, and appearance are unmatched, but why exactly? Read on to find out about the life-changing advantages that dental implants have over other replacement options.